If you're labeling rough-in work or other installations, there are times when you need to "write and run". That's why we created the super-fast, super-easy RHINO 101 Reusable Label Dispenser. 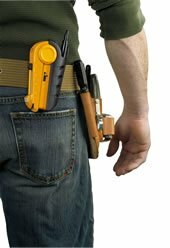 Designed to clip to your belt for instant access, this affordable, rugged tool includes a number of ergonomically-designed features to make labeling easy. 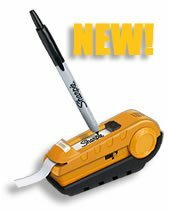 To speed you along, the RHINO 101 gives you a large "writing window" (to view your work easily), a built-in label cutter (for simple, one-handed operation) and a thumb-driven label advance (for moving to the next label without smearing). Your writing tool? We've left nothing to chance. The 101 includes the best retractable, permanent marker: Sharpie. Everything is housed in an industrial-grade construction body - so a drop to the floor won't mean a trip to your truck. With industrial-strength adhesives and continuous testing, these materials have helped us earn our "stick-and-stay-stuck" reputation. We expect they'll do the same for you.